Yesterday we went on a last minute trip to Corfe Castle in Dorset. Not very local – but we were forecast all rain in London so my husband cleverly noticed that if we just went quite a bit further West we could escape that and still get a good day out – so why not! I will put a full post up when I get chance as it was a lovely place and I would definitely recommend but for now, here is my #SundayPhoto of the boys having fun exploring the ruins. We are thinking of getting National Trust membership as we have really enjoyed the few places we have explored so far. Which National Trust sites would you recommend for young families? Let me know in the comments! We are going to be taking part in an exciting project with the National Trust soon, so keep an eye out for that too! Also linking up to What’s the Story as this photo tells the story of our last minute trip and has some good memories! « The Anagranimals and The Wishing Tree » A Baby Super Hero? What a lovely place to explore. Well done on avoiding the rain. Bet the boys had fun exploring there! Corfe Castle is a wonderful place, I can’t wait to take The Boy there one day. Well done for escaping the rain and finding a good day out. We keep wondering about whether to get the annual membership too. Not sure yet but the blurb does look good! 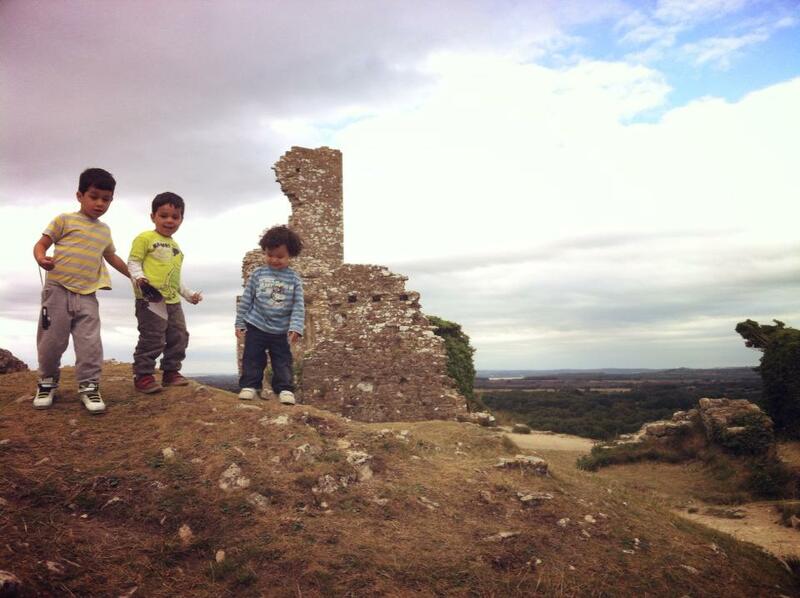 What a lovely picture – we love Corfe Castle and are lucky that its local! Keep an eye out for NT offers at places you visit – some have 25% off. Our roving NT man @jurassicoastin always has them too. Our fave NT places in Dorset are the Studland beaches, Corfe Castle, Kingston Lacy, Burton Bradstock, Bradbury Rings, Brownsea Island. Moving North are Stonehenge and Stourhead. I’m not that familiar with places close to you although Nymans in West Sussex has lots for kids to explore and Knole is beautiful!! Chelseamamma recently posted…John Lewis help you keep the kids entertained this summer! We have spent all day today at the Osterley Park country fair. It was a lovely day out but the gardens and house are lovely anyway. They have just redone some of it they have a little second bookshop and a shop in addition to the cafe now. Perhaps you’ve already been if you live in London? It’s worth a go if not. Clumber Park is lovely too, I used to live local to it, spent lots of time there as a kid. We haven’t actually – but we will! Thanks! yes a bit far for a day trip but we have been thinking of coming over there for a holiday, didnt make it this year so maybe next. husband really wants to see giants causeway. have fun on your secret day out – sounds interesting! thanks! I need to go through and make a list of everyone’s suggestions then we can go through and do all of them whenever we pass through each area!